they can’t wait to showcase a mix of their best sellers with a friendly sales team and partner parks on hand to answer any questions you may have. Avanti 42 x 20 – Spring is in the air inside this street style bungalow. A front entrance home with a contemporary twist to suit most tastes. Like the Grand Hardy a separate lounge and an open kitchen dining room with a large island. Lots of storage space to suite all household needs. Sofia 45 x 20 – Elegance is in the name. Sofia has an eye-catching exterior with an atmospheric interior to match. 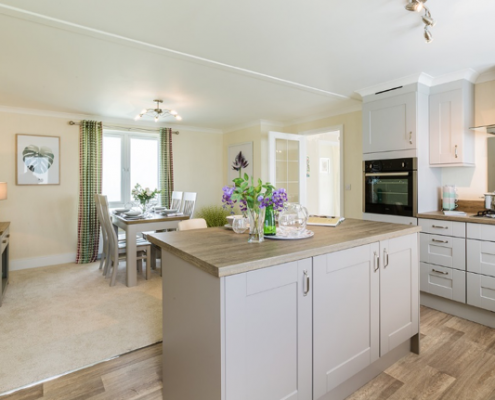 Large French doors open out from a full-width lounge while the well-equipped open plan kitchen/dining room has its own back door to offer family accommodation at its best. 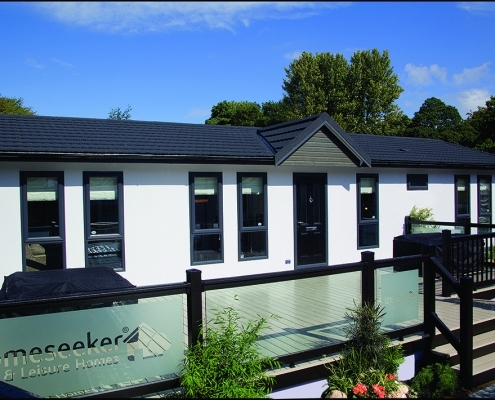 Bella Vista 42 x 20 – Our hybrid home that’s suitable for residential or a holiday home, you choose! 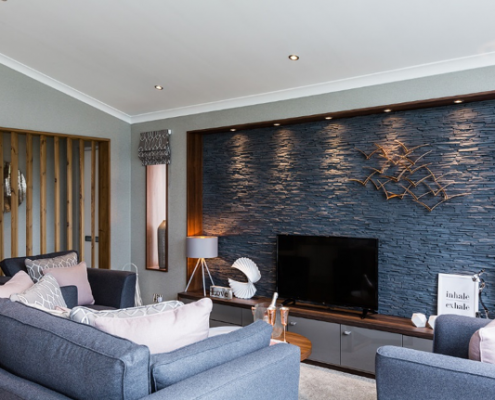 A striking contemporary exterior, with impressive features such as the vertical thermowood brise-soleil partition separating the open plan living space and a slate panel grey feature wall in the lounge area which is complemented by a full width media unit in walnut and dark grey gloss units. A classy interior with textures of grey and touches of blush pink in the cushions. Glass House 42 x 20 – An iconic architectural design that will live the test of time. The Extraordinary elevated roof profile, glazing and skylights that surround this boutique lodge brings the outside in. Its industrial chic interior is contrasted with the soft fabrics coloured with warm greys and creams ensuring this lodge is timeless. Burleigh 40 x 20 – Exceptional value for money with no compromise. One of our latest models that is no doubt a bestseller. 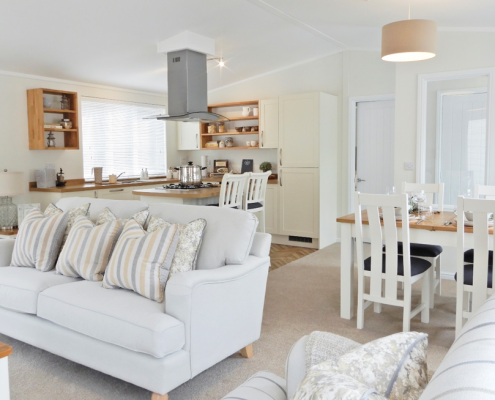 This holiday lodge is home from home with open plan living, vaulted ceilings and surrounded by windows which create a light and airy home. It’s fresh and modern and no doubt will turn heads!